There is a persistent rumor that circulates regularly about how it isn't safe to jump start a car, or that it isn't safe to use a jump box. While there is a grain of truth in this rumor, in that you can do a whole lot of damage to your car, or to yourself, if you hook things up wrong, using a jump box is perfectly safe in most circumstances. If you connect everything the right way, and you take all the necessary precautions, there is very little to worry about. Is it Really Dangerous to Jump Start a Car With a Jump Box? There are three major sources of danger when you jump start a car, and they both apply whether you use another car or a jump box as the source of power. The first is that the dead battery may have explosive gas leaking out of it, the second is that you can severely damage the vehicle's electrical system if you hook the jump box up backwards, and the third is that the jumper cables or jump box must be routed or set in a safe location. While it's true that there is a certain level of risk involved in jump starting a car, you can minimize it to almost nothing if you follow the correct procedures. There are also a few instances where jump starting really is a bad idea. For instance, many hybrid vehicles have a 12 volt auxiliary battery that can be jump started if it goes dead, but attempting to use this low capacity battery to provide a jump start to someone else is a bad idea. The problem is that such a small battery may end up completely drained after providing a jump start, which could leave you stranded. So while most hybrids can be jump started, think twice before offering one to someone else. There is another potential jump starting issue that’s associated with vehicles that have batteries that are difficult to access. Some of these vehicles have a remote positive terminal for charging and jump starting the battery, and others require you to do some work to access the battery. In cases where a remote terminal isn’t available, it’s typically a bad idea, and potentially even unsafe, to jump the vehicle by using the positive terminal on the fuse box, or any other connection that isn’t actually the battery. As far as portable car jump starters are concerned, they’re perfectly safe with the one caveat that you still have to follow all of the correct procedures. You still need to hook a car jump starter up in the right order and in the right places, and you can only use one to jump start a traditional car battery or the auxiliary 12V battery in a hybrid, but not the high voltage batteries in a hybrid. There are two main dangers that are commonly associated with jump starting a car: damaging delicate components in the electrical system, and blowing up the battery. Both of these situations can result from crossing the positive and negative cables or shorting them out by touching the positive and negative leads together. Connect the positive jump box cable to the positive terminal on the battery. Connect the negative jump box cable to the engine block or another good ground location. Set the jump box in a stable location in the engine compartment, or on the ground if possible, where it won't become detached, fall, or interfere with the engine pulleys or fan. Attempt to start the car. Carefully disconnect the negative jump box cable and secure it to the jump box. Carefully disconnect the positive jump box cable and secure it to the jump box. The safest way to hook up a jump box is to connect the positive lead to the positive battery cable and the negative to either the engine block or another good ground location. It is still possible for your battery to blow up if you’re using a car jump starter, which is why it’s so important to hook the cables up right. If your battery is accessible, then you’ll want to hook up the positive jump starter cable to the positive battery terminal first. If the battery isn't accessible, look for a remote positive terminal. With the positive cable securely connected, you’ll need to locate a clean, unpainted part of the car’s body, frame, or engine that isn't in close proximity to moving parts like the fan, accessory belts, or the battery itself. The main reason that you don’t want to hook up your car jump starter directly to the negative battery terminal is that doing so can create sparks. If your battery isn’t working due to having been overcharged, or due to an internal fault, it may be full of flammable vapors, which can seep out even if the battery is sealed. Sparks can ignite these vapors, which can cause the battery to explode. If this happens, you may be showered in acid and severely injured. Although this isn’t incredibly common, it can cause serious injuries, and according to The Straight Dope, it may happen to somewhere between 6,000 and 10,000 motorists each year. In some cases, jump boxes have cables that are so short that you need to connect both of them directly to the battery. If your jump box is like this, then it's important to make sure all of the accessories, like the lights and radio, are off, and that the key isn't in the ignition. When connecting both positive and negative cables to the battery, connect the positive first, and then carefully connect the negative. If possible, wear protective clothing, eye protection, and attempt to shield yourself from a potential explosion. When Is It Unsafe to Use a Car Jump Starter? If you drive a hybrid, then it’s typically safe to use a car jump starter, or a regular jump start, on the auxiliary battery. These auxiliary batteries are nominally 12V, just like regular car batteries, but they’re typically much smaller. That means the main danger associated with hybrids and jump starting is that if you try to use the auxiliary battery in your hybrid to jump someone else’s car, you may end up depleting it to the point where your own vehicle won’t start. It also means that it’s perfectly safe to use a jump starter or portable power pack on that type of battery. The other type of battery contained in most hybrids uses a different, much higher voltage than the 12V used by conventional cars and trucks. That means you can’t jump start the main batteries in your hybrid with a car jump starter or jumper cables and another car. Electric cars are similar, but with the added caveat that if you drive an electric car you should never attempt to either provide or receive a jump start. Electric cars are meant to be charged in a very specific manner. If you drive a regular gas or diesel vehicle, and it has a battery that’s difficult to access, then it may or may not be safe to use a car jump starter. It’s perfectly safe to use one if your vehicle has a remote positive terminal that’s designed for charging and jump starting, but you should never hook up the positive clamp of your portable jump starter to the fuse box or anything else that isn’t actually meant for that purpose. In some cases, the only safe way to use a portable jump starter is to gain access to the battery and connect directly to the positive terminal. Depending on where the battery is located, it may then be impossible to make connections to both the positive battery terminal and a clean, unpainted section of the body or frame. This can make it difficult to use a jump box if the included cables are too short. 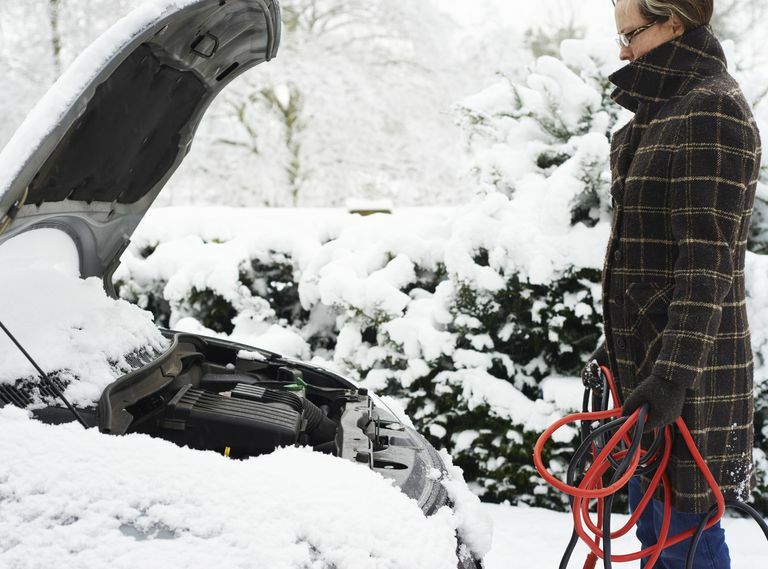 In this type of situation, you may have to use actual jumper cables or a jump starter that has longer cables. Is It Safe to Add an Auxiliary Battery?